This article is from the ITN News Website. Police have released what is believed to be the first footage of a ‘relay crime’ in the region – a crime that involves thieves being able to steal cars without needing to even see the owner’s keys. 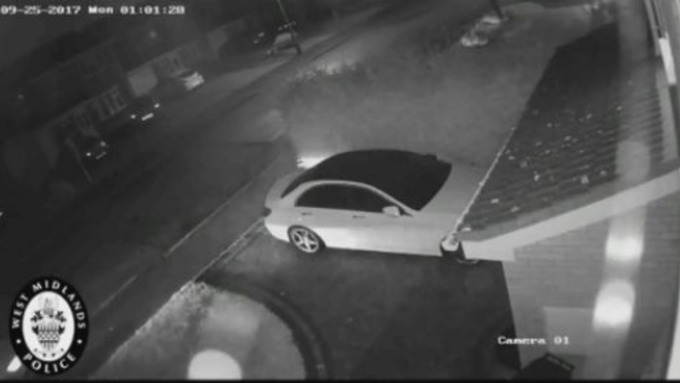 The video released by West Midlands Police shows two men pulling up outside a house with relay boxes. It’s believed that the devices are capable of receiving signals through walls, doors and windows, but not metal. In the footage of the incident which happened in the Elmdon area of Solihull on the night of Sunday 24 September, one of the men can be seen waving a relay box in front of the property. Police say the box receives a signal from the key inside and transmits it to the second box next to the car. The car’s systems are then tricked into thinking that the key is present and unlocks. The Mercedes has not been recovered following the incident. To protect against this type of theft, owners can use an additional tested and Thatcham-approved steering lock to cover the entire steering wheel. We also recommend Thatcham-approved tracking solutions fitted to the vehicle. Posted by Mr. Bloggy on 27/11/2017 in Car Key Copying, Car Theft, News and tagged Car Key Theft, Car Theft.